Poppystamps craft die featuring the sentiment "Best Wishes". Steel cutting die from Elizabeth Craft Designs. Compatible with most leading die-cutting machines. 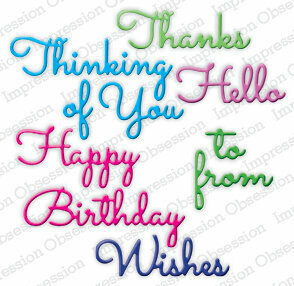 Some of the most used sentiments are offered in this set: Congrats, Happy Birthday and Best Wishes. Use them separately or together, the choice is yours. Spellbinders Shapeabilities Die D-Lites cut, emboss and stencil with a single die template. 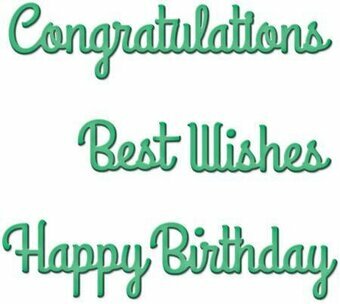 Approximate Die Template Sizes: Congratulations: 2 7/8" x 3/4", Happy: 1 3/8" x 5/8", Birthday: 1 3/4" x 5/8", Best: 1" x 1/2", Wishes: 1 1/4" x 1/2". Penny Black Creative Dies featuring the sentiments "Thinking Of You", "Best Wishes", and "Thank You". This is a set of 10 word dies featuring the sentiments "Thanks", "Thinking Of You", "Hello", "Happy Birthday", "To From", and "Wishes". The lowercase letters are 1/4 inch tall and the uppercase letters range between 1/2 inch and 3/4 inch. These are US-made steel dies compatible with most table-top die cutting machines. Bold best wishes never go out of style and are always appreciated. This scripted sentiment emulates a handwritten style and arrives to you etched together in a single die to make alignment on your projects easy as pie. 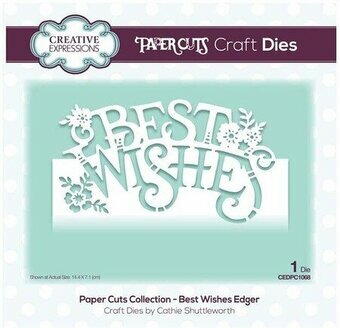 The Best Wishes Die-namics measures 3 1/4" x 2 7/8". The Paper Cuts 3D collection includes dies that allow you to cut out 3D shapes. These fun dies can be mounted on a card for a 3D effect, or they can stand alone as paper decoration. This die features a freestanding deer with butterflies and mushrooms. Includes 10 dies. Size: 3.9 x 5 inches. Add interest to handmade greeting cards, scrapbook layouts and heirloom albums with uniquely shaped ornamental tags! A wonderful selection of tags in various shapes and sizes come together in the Ornamental Tags Die collection, creating a diverse assembling of die cuts perfect for all of your paper crafting needs! Opt to use multiple sized die cuts to create tags with a beautiful layered look, or choose to use as a single layer embellishments! Approximate Image Sizes: 1. Large Traditional Tag 1: 3.0" x 1.5", 2. Small Traditional Tag 2: 1.75" x 1.0", 3. Best Wishes Tag 1: 2.0" x 1.75", 4. Best Wishes Tag 2: 1.5" x 105", 5. Swirling Ornamental Tag 1: 4.5" x 1.75", 6. Swirling Ornamental Tag 2: 3.25" x 0.5", 7. A Gift for You Ornamental Tag 1: 4.25" x 2.25", 8. A Gift for You Ornamental Tag 2: 4.0" x 2.0", 9. A Gift for You Ornamental Tag 3: 3.5" x 1.0", 10. Large Ornamental Tag 1: 2.5" x 2.75", 11. Small Ornamental Tag 2: 2.25" x 2.0". Spellbinders Shapeabilities cut, emboss and stencil with a single die template. Approximate Size: Hi: 3/4 x 1", So: 1 1/8 x 3/4", Sweet: 2 1/4 x 3/4", Best: 1 1/2 x 5/8", Wishes: 2 3/8 x 5/8", Happy: 1 3/4 x 3/4", Birthday: 2 3/8 x 3/4", Thanks: 3 1/4 x 1 1/8", Congratulations: 3 1/2 x 3/4". Vineyard Wine Bottle Tag Stamp and Die Set Wine Country by Stacey Caron brings both worlds together of die templates and coordinating stamps to give these images life. These cling (EVA) rubber stamps are designed to be used with an acrylic block. This set includes two etched dies with three coordinating stamps. Wine Country Collection by Stacey Caron will make your projects the toast of any wine tasting, parties or gifts with coordinating motifs to create accents to charms to tags...such great fun! Approximate Size: Dies: Wine Bottle Tag: 4.05 x 4.20 in 10.30 x 10.70 cm, Tag Insert: 2.30 x 1.65 in 5.80 x 4.20 cm. Stamps: Best Wishes: 1.70 x 0.40 in 4.30 x 1.00 cm, Celebrate: 1.6 x 0.40 in 4.10 x 1.00 cm, Cheers: 1.25 x 0.80 in 3.20 x 2.00 cm. attered Lace Die - Washing Line Best Wishes. Detailed and delicate, Tattered Lace Dies are the most intricate dies available. This topper die gives you the perfect finishing touch to all of your projects. This die measures approx 13.3cm (5 1/4") x 2.3cm (15/16").